I remember a conversation from back in my student days where my typophile friends and I debated what the ultimate typeface of the 20th century was, a typeface that summed up all of the era’s advancements and knowledge into a coherent whole, one that would be a reference for years to come. Helvetica was one of the candidates for its sheer ubiquity, proof of its overall acceptance. Another, more subtle proposal was Jan van Krimpen’s Romulus, one of the first typefaces to have related Sans and Serif versions. 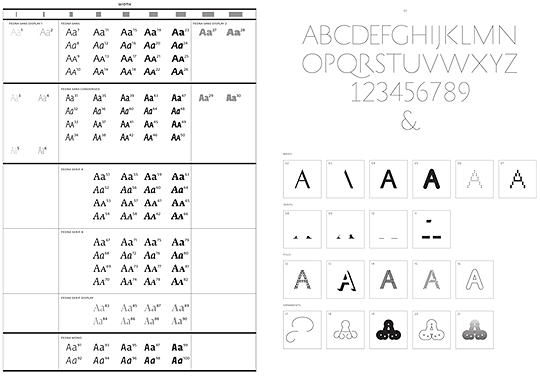 And another, my personal pick, was Univers by Adrian Frutiger. 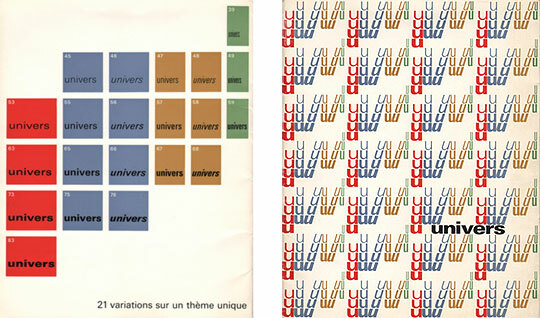 Univers specimen, Deberny et Peignot, Paris, 1964. Image courtesy of Linotype GmbH. Univers goes beyond the quest to design individual letters, attempting instead to design space, to create a system of relationships between different sets of shapes which share distinctive parameters. Prior to Univers, type designers concerned themselves with the relationships between letters of the same set, how an a is different from a b. Univers creates a situation in which there are a’s of many different shapes, and each has to be positioned on the axes of weight and width, distributed sufficiently far away from the next, but no further, in order to create a usable system. How heavy ought the Medium to be in order to leave space for yet another weight, the Bold, and how will this translate into a design with condensed proportions? These were all new questions for type designers, and Frutiger opened up completely new territory for those who were to come after him. Thanks to Frutiger it is now common practice to produce a dozen or more styles when working on a new type family. In terms of typeface innovation there is much more room for originality than when you only look at the individual lettershapes. Thus to create truly useful new works, type designers need to examine not only how characters relate to each other within a style, but also how different styles relate to each other within a family. I’ve designed large typeface families before. Fedra, for example, now has over 116 individual styles supporting 170 languages, and has been used in the most complex typographic situations from dictionaries to newspapers, Bibles and information graphics. But it is not really an example of a font designed to be a typographic system from the start. It started in 2001 as a relatively small family of Sans, and over the next 10 years it grew to include Serif, Monospaced, Condensed and Display styles, as well as different language versions. Fedra is an example of a bottom to top approach, in which a relatively simple design gets larger and more complicated over time. Composer Brian Eno calls this the gardener’s approach: nurturing simple things towards greater complexity, carefully planting seeds, and helping them grow to their full potential. The opposite organising principle, again in Eno’s words, is the architect’s approach. An architect traditionally starts with a concept, developing the complete idea first, working from top to bottom. History (2008) is an example of the architectural approach, in which each individual style contributes to a greater purpose, sharing proportions with the rest of the family. 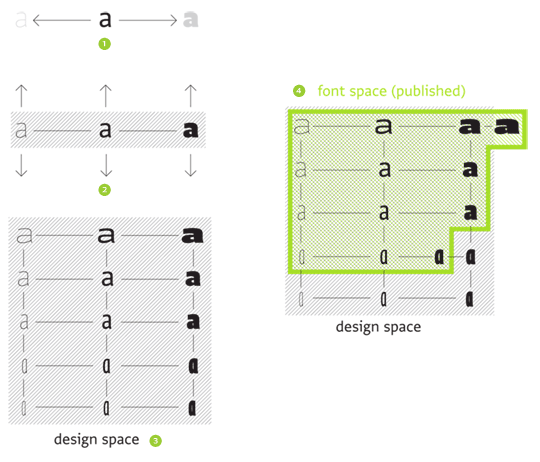 History (2008) as an example of the ‘architectural’ approach and Fedra (2001-2010) as an example of the ‘gardener’ approach to creating a type family. Greta Sans is another example of this approach. It has been carefully planned from the outset, designed as a system of interrelated styles. 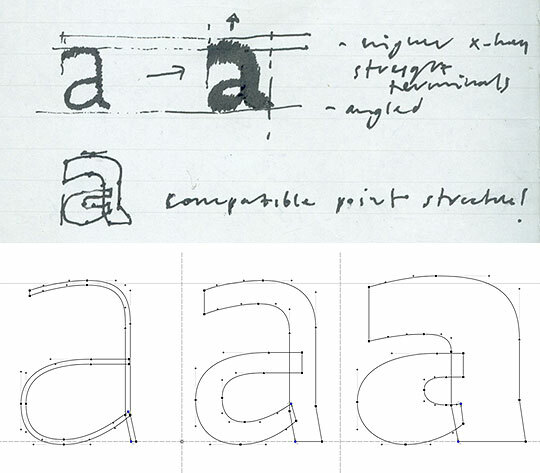 From the very beginning, work proceeded on multiple styles simultaneously; not only when sketching the extreme and middle styles on paper, but also when converting the resulting shapes into digital format, the emphasis was on testing how certain letterforms react to extremely compressed dimensions as well as very generous ones. Only after being tested at each end of the proposed spectrum would the designs be selected and adopted into the typeface family-to-be. Each glyph would have to anticipate all its variations and maintain a basic structure that could function across all designated width and weight variations. Different design masters were conceived and drawn at the same time, investigating how the same design characteristics would be translated into extreme weights and widths. The nature of systems is to dictate a certain direction; the role of designers is to recognise when the original design idea ceases to work within the system, and then to create exceptions to the system rather than letting the system have a negative impact on the design. In large type families of related styles this impact is usually that while the starting point is usually characteristic and recognisable, the design becomes blander and less interesting as it is stretched across its variations. My intention was to design a highly flexible system while also ensuring that the resulting shapes were not just compromises, but maintained the strong personality of the Greta typeface. 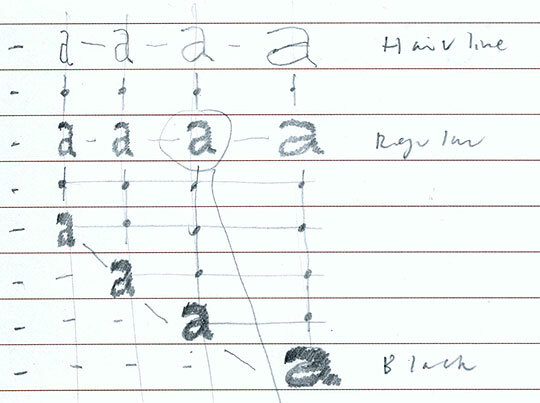 Sketches from 2010: planning the Greta Sans type system. For example, at the lighter end of the weight axis, the circular dot over ‘i’, (or in diacritics and punctuation) has to become a rectangle to avoid becoming too small. On the width axis, shapes would sometimes have to be modified even more dramatically: the double storey ‘g’ typical for Greta becomes a single storey ‘g’ in Compressed width, where the lack of space demanded greater simplification. Dollar and cent signs have full crossbars in the wider versions, but divided crossbars in the condensed versions. Dozens of other changes happen when taking the design to extreme dimensions, in order to maintain the general design characteristics and preserve the natural look of the shapes. Some of the exceptions to the linear interpolation of the Greta Sans type system: dots change from circular to rectangular; dollar signs lose their crossbars, and ‘g’ uses a single-storey form in Compressed widths. While the Fedra Sans family was created from two design masters, Light and Bold, (Book, Demi and Medium were interpolated), Greta Sans’ 13 design masters were individually designed, as were another 13 masters for italics, and all 26 included Small Caps. The masters (Hairline, Regular, Black), were interpolated and expanded to 10 weights. Four widths were imagined and implemented, resulting in 80 styles. The process of drawing Greta Sans started in the middle of the imagined design space (1), and from there the extremes were explored (2). The idea was to adapt the design to the available proportions, while preserving the main design characteristics. When creating the design masters, we made the heavy weight as heavy as possible, even when those exact weights would not be used. It is easy to interpolate and make the Black weight lighter; making it heavier is complicated. This allowed us to keep the design space as large as possible (3), and reduce it later when we made the final selection of styles. We decided not to use the Compressed Black as a master, and stepped it down one weight. We also dropped extra-compressed styles. On the other hand, we added an extra weight to the Extended styles (Super), when we saw there was available space at that end of the spectrum. In the earliest age of movable type, optical sizes became the main organising principle of typefaces. For example, Jannon's caractères de l'Université from the 1530s include numerous optical versions ranging from 6 to 36 points, each slightly different. The design of the typeface would be reinterpreted at each given point size, often resulting in different weights, different proportions, different letter spacing. These different designs would blend into a harmonious size progression and function as one design. Optical sizes disappeared with the transition from hot metal press to photocomposition sometime in the 1950s. After about 50 years of neglect optical sizes have made a comeback, and many typefaces now come with versions specifically designed for text and display applications. 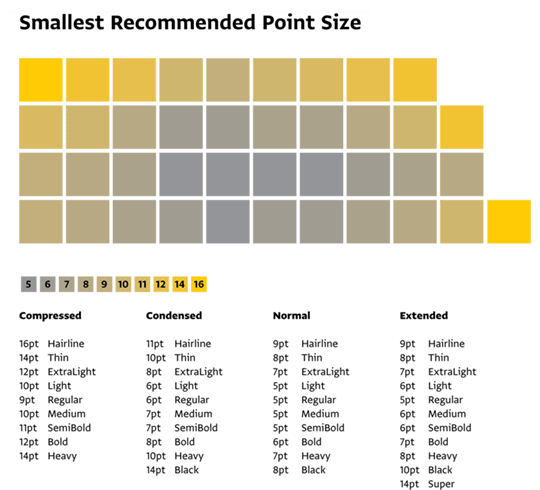 Optical sizes, however, represent a range of variations. 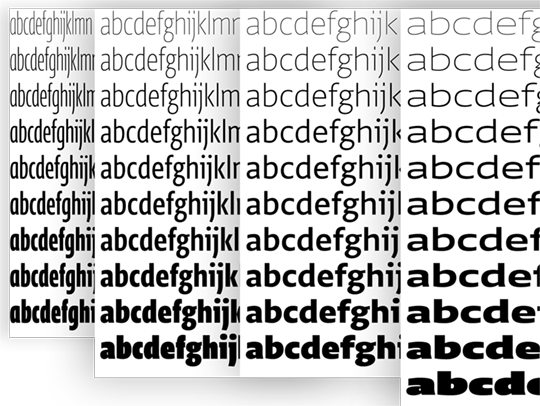 In the old days, as in the Jannon example, typefaces would come in as many as 15 optical versions. All the in-between sizes progressively added or removed features, getting continuously darker and looser when meant for small sizes, or continuously lighter and tighter for large sizes. The word continuously is important here. There weren’t text or display versions as is common now. Each size was discretely adjusted for to maintain the characteristics of the typeface. Jannon’s caractères de l’Université from the 1530s includes 15 optical versions ranging from 6 to 36 points. On the left is a 7pt sample scaled 425% to match the 36pt version. Note the difference in contrast between the thick and thin strokes, and overall differences in details between the two versions. Greta Sans was designed as a continuous optical size system. While the basic text styles (Regular) are spaced and kerned for small sizes, the surrounding extremes (Hairline, Black) are designed to be used as Display types, and therefore tightly spaced and kerned. The resulting interpolation then runs continuously from Display to Text to Display use. A similar pattern (Extended, Condensed, Extended) can be seen on the width axis, as the Normal styles are most suited for small text, and extremes are optimised for large sizes. While the key characteristics of most typefaces are defined by the outlines of the letterforms, Greta Sans’ design also extends to the gaps between styles. All its characteristics, including the visual contrast between styles, weights and widths have been orchestrated into a unified typeface system. Greta Sans explores the entire space of possibilities and is designed for extraordinary design flexibility. It is a toolbox that addresses a broad spectrum of design situations from the simplest to the most complex, offering multiple options for establishing a visual hierarchy. Greta’s Latin fonts set up some formal parameters, but the most exciting phases of this project are still to come. While such a versatile system of similar proportions is rare within the context of Latin typefaces, it is unheard of in the domain of non-Latin type. In 2015, we expanded the system by the Cyrillic and Greek support. And for 2016-2017, we plan Arabic, Hebrew, and Devanagari versions. There is no reason why only Latin type should benefit from these advances in typography. Greta Sans was conceived by Peter Biľak, designed and produced together with Nikola Djurek.